Should solar firms integrate down the supply chain in times of crisis? Consolidation amidst the shakeout in the solar industry has a number of looks. There's the attrition we've seen from Q-Cells, Solon, Odersun, ECD, and others as firms fall to bankruptcy, victims of their high cost structures and intense competition. There's the manufacturing restructuring path, with announcements in the last few days of shuttered production lines at First Solar and SunPower. 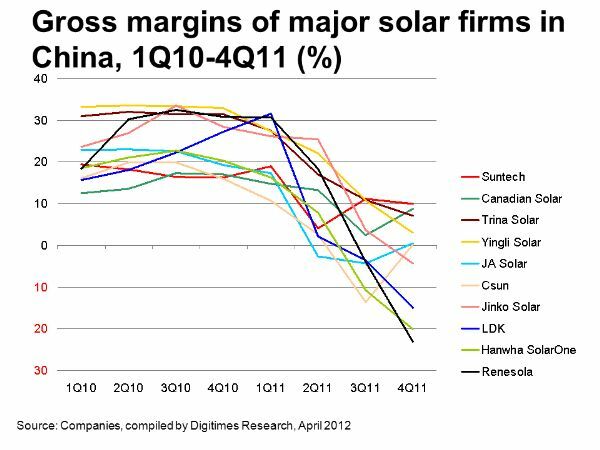 There's the massive collapse of companies in China's polysilicon industry. In a solar market full of subsidy uncertainty, plummeting margins, and global oversupply, what strategic moves can a module supplier make to minimize risk and recover margins? Canadian Solar (Nasdaq:CSIQ), a gigawatt-scale solar module manufacturer announced that it will acquire majority ownership in 16 solar power projects in a JV with SkyPower Ltd. in a $185 million deal. SkyPower is a large Canadian developer and financier of solar farms with more than one gigawatt in its project pipeline, according to the company. SkyPower has a footprint in Ontario and a $67 million credit facility from Deutsche Bank. Although headquartered in Ontario, SkyPower is majority-owned by California-based real estate and investment firm CIM Group. The JV between Canadian and SkyPower will look to build solar power plants in emerging markets. Note that Skypower used to be owned by Lehman Brothers and had to file for protection from creditors back in 2009 after Lehman went under. The 16 solar projects have 20-year PPAs from the Ontario Power Authority and most are under Ontario's Feed-In Tariff Program. The projects are expected to produce power in 2014 and yield more than $800 million in revenue for Canadian Solar. So, that's another way to deal with this market: move some of your efforts downstream to project development, where low-priced panels are actually a good thing. This strategy has been used before by First Solar and SunPower. Both of these companies became successful solar developers through acquisition of product pipelines across the globe. Although SunPower and First Solar are struggling (like every solar manufacturer), it can be argued that the companies would be out of business (or acquired) if they had remained pure-play module suppliers. Of course, downstream holds its perils as well, especially in today's subsidy climate. 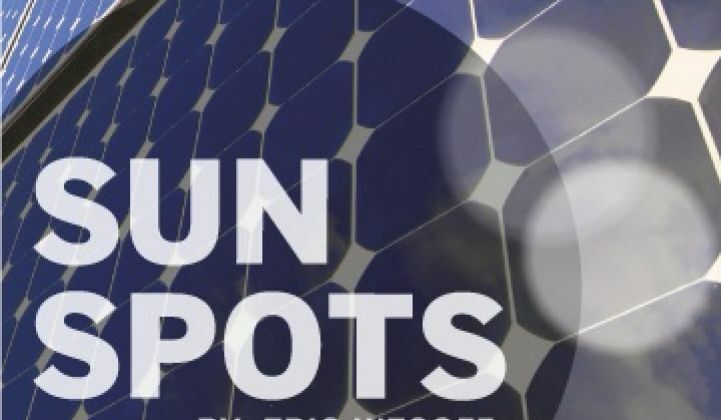 Suntech has chosen not to go down the solar project developer and financier path on the premise that the company does not want to compete with its customers, according to officers of the firm. 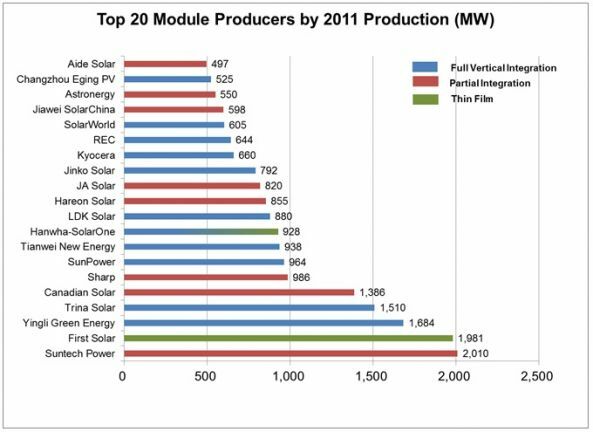 Canadian Solar is the number five module manufacturer in the world, with 1,386 megawatts produced in 2011, according to GTM Research. Shares of Canadian Solar are trading at $3.54, up slightly and giving the company a market cap of $152.7 million. Chart from GTM Research. Meet the solar analysts who've gathered and parsed this data at the GTM Solar Summit.